The foldable quadrotor is small enough to fit in a hand (Photo: LIS, EPFL, NCCR Robotics). The use of robots to find victims after natural disasters is fast becoming commonplace, with well documented cases where robots have been sent into areas too dangerous for rescue workers. While the issues surrounding robustness, control and autonomy are frequently cited as key areas for research, a team from LIS, EPFL and NCCR Robotics is working on another important aspect, how to make flying robots easily transportable and quick to deploy. 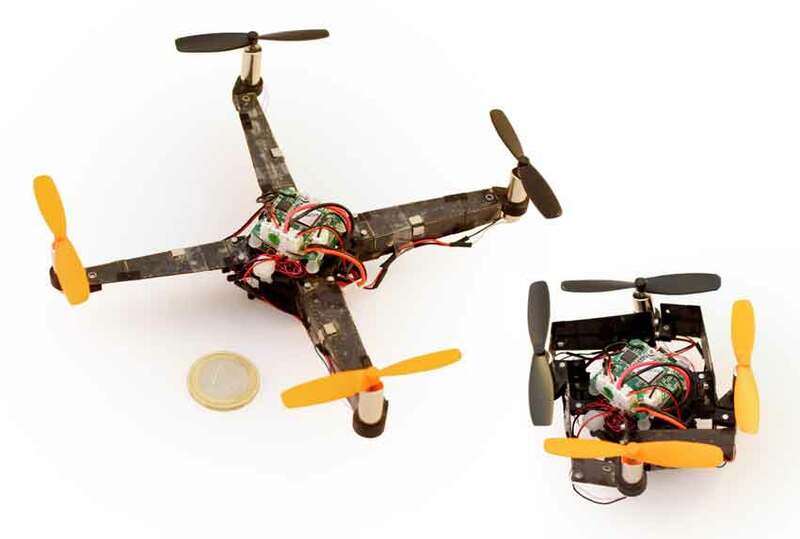 In a paper, which will be presented at the International Conference on Robotics and Automation (ICRA) 2015, the team describes how they made a quadrotor with rapidly self-deploying, folding arms. Foldable aerial platforms currently use either beams or detachable appendages (e.g. 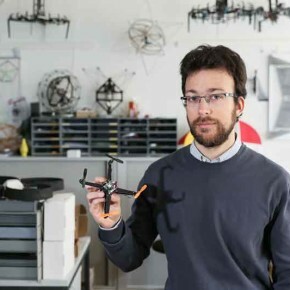 DJI spreading wings series and SenseFly eBee), which require manipulation by the user, slowing the process down and introducing the possibility of human error. The presented prototype has self-deploying arms that go from completely stowed to ready-to-use in 0.3 seconds, meaning that multiple drones can be utilized at once in a very short period of time. The origami arms are stored using a system of strategically placed magnets, which can use the torque and thrust generated by the propellers to break the magnetic seal, thus allowing the arms to deploy when the quadrotor is switched on. In order to make use of such a simple mechanism, the design team carefully considered the placement of the folds in the arms; to take advantage of the propeller’s torque, folds are parallel to the its axis. The origami structures that make up the arms allow them to fold around the central core, reducing its volume to about a third of commercial quadrotors of a similar weight. To make the origami structures, the arms are constructed from a 0.3mm layer of fiberglass over Icarex, a lightweight and inextensible fabric. Two vertical folds in the 2D structure allow the arms to lie in the wrapped configuration. When the motor begins, the action of the propellers forces the magnets apart and allows the arm to straighten in its flat configuration, whereupon a second set of magnets attract and pull the horizontal fold (down the centre of the arm) closed, creating a stiff, 3D structure with no need for heavy locking mechanisms. 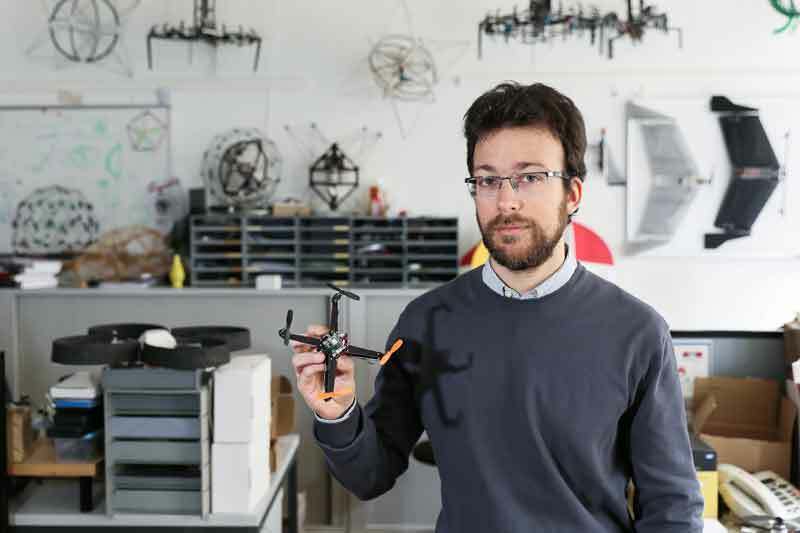 First author Stefano Mintchev holds the quadrotor (Photo: LIS, EPFL, Alain Herzog). The folding quadrotor currently doesn’t have an automatic “putting away” mode, meaning that the arms must be manually returned to the wrapped configuration. However, at the deployment stage, where speed is of the essence when trying to locate vulnerable people, this mechanism may just be a lifesaver. S. Mintchev, L. Daler, G. L’Eplattenier, L. Saint-Raymond & D. Floreano, “Foldable and Self-Deployable Pocket Sized Quadrotor,” In 2015 IEEE International conference on Robotics and Automation (ICRA 2015), Seattle, Washington, USA, May 26-30, 2015. A pdf of the full article can be downloaded from infoscience.